Leonard Valdes, is an accident attorney in Miami, looking to target the large Spanish population that surrounds the city. On top of that, he also wanted to target the city of Homestead but without having to have multiple websites dedicated to multiple cities. For a busy attorney, the less they can juggle online when it comes to websites, the better. At first glance, we knew that the site was created on GoDaddy’s Website Builder, a very restrictive platform, not meant for long term growth SEO-wise. So we immediately advised to recreate an entire new site on WordPress and to sign up with our favorite web hosting company – SiteGround. The previous design did not have his logo, so for this one we implemented it and kept a cohesion between colors and fonts. The home page banner has a purpose now, we included a clear headline which states what the company does with actionable button that leads to their contact form. All services are clearly laid out to let their audience know what their focuses are, and are clickable, leading to their own individual page. We cleaned up the content, adding more information, corrected grammar and punctuation. Added on-page SEO factors to help tell Google and the audience what the page is about. The website is now responsive and mobile-friendly which will help him begin to rank on mobile devices. More importantly it is set up for growth. Whether it is to write blogs, add new core pages or even a sub-folder! We created an individual contact page for Homestead which can be used for SEO purposes and link building for multi-office firms. 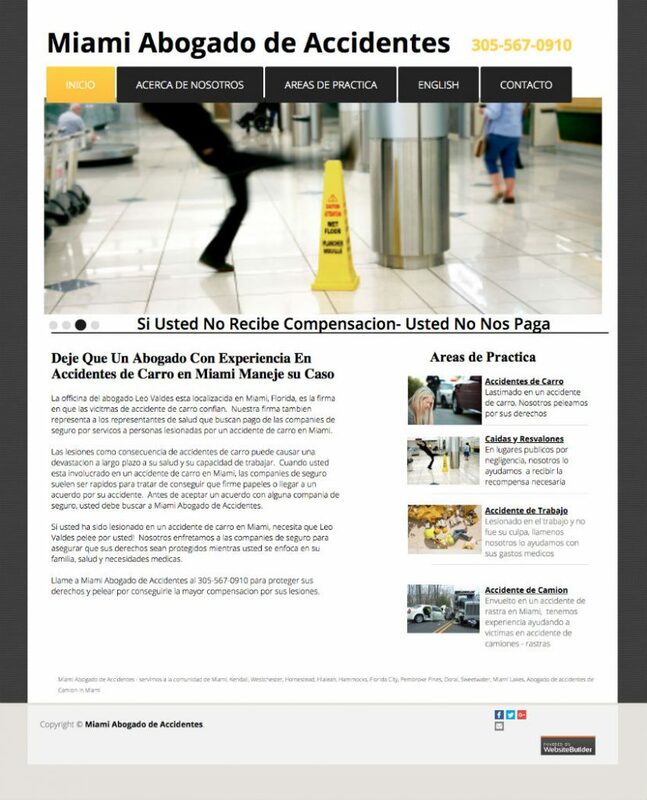 If you are need of a website- whether it is in Spanish or English, we are here to help. Let us know what you think about the new layout, hierarchy of information, colors and overall design below!